V2497. ZARA DOLUKHANOVA, w.Nina Svetlanova (Pf. ): Songs by Scarlatti, Strauss, Ravel, Shaporin, Arutiunian & Prokofiev; Arias from Don Carlos, Tsar's Bride & Kashchey the Immortal (Rimsky-Korsakov). [Dolukhanova's exquisite rendition of Prokofiev's 'Green Glade' alone is worth the price of this entire program! A pair of rare recitals which feature Dolukhanova, beautifully recorded from down front in Leningrad Philharmonic Hall in remarkably clear sound.] (Canada) St Laurent Studio YSL T-719, Live Performance, Philharmonic Hall, Leningrad, 13 Dec., 1961 & 14 Dec., 1964. “This disc (discreetly labeled ‘Volume 2’ on the spine) comprises excerpts from a pair of recitals given on December 13, 1961, and December 14, 1964, in the Great Hall of the Leningrad Philharmonic. 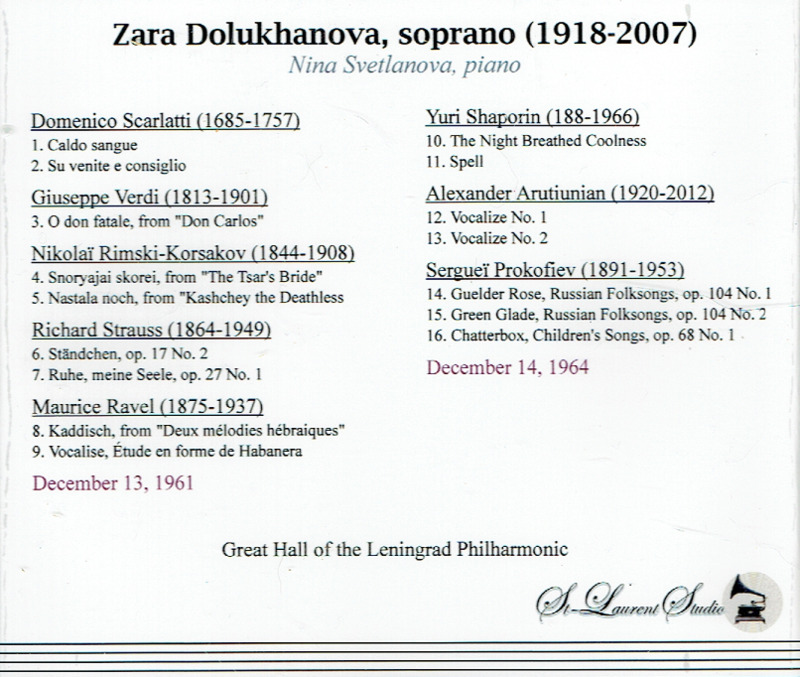 Nor were they the only recitals Dolukhanova gave in those years. In fact, the ‘60s were to prove a very busy decade for her, including several national and international tours. As caught here she's in excellent form, and these are welcome additions to her catalog. If the Italian of her pair of Scarlatti songs (listed on the jewel box and in the contents page as by Domenico, but the composer was actually Alessandro) sits oddly on her vocal production, there's still no denying in ‘Caldo sangue’ her seamless cantabile singing, or her ability to bow the line. ‘Su venite e consiglio’ displays a fine command of mezza voce. She substitutes her voice's natural vibrato for the trills, but manages a stylish little figure on the penultimate syllable of the last ‘pensieri’. Far more impressive, however, is her version of Ravel's ‘Kaddish’, from his DEUX MÉLODIES HÉBRAIQUES. It is an object lesson in color achieved by sustaining notes and changing their quality through differing degrees of chest tone, and the application of a wide range of dynamics. The audience starts applauding before pianist Nina Svetlanova concludes the piece, as well they might. The composer's Vocalise (‘Ètude en forme de Habanera’) is cut from the same cloth, and Dolukhanova delivers once again. Here, she does trill, and successfully, as well as conclude the piece by diminishing her voice to a thread which doesn't fray. With a voice such as hers, its strength, breath support, and tonal variety, it's not surprising that the 1964 concert supplies a pair of vocalises as well, this time by that fine Armenian composer, Alexander Arutiunian. Equally impressive are the outer sections of ‘O don fatale’. Dolukhanova is fearless and direct in her attacks, managing a comfortable A below high C at ‘ti maledico o mia belt’, and a still better A-flat before the aria's final cadence. The central section, ‘O mia Regina’, isn't as fine an achievement, with Svetlanova almost entirely inflexible in her tempo. Which isn't to say that Dolukhanova lacks the breath support or dark chest tone to make the melody memorable, but that the phrasing is square. The singer's German is more idiomatically managed than her Italian, and her version of Strauss' ‘Ständchen’ possesses a measure of lightness and charm that I typically associate with Fischer-Dieskau in this song, rather than Dolukhanova. In the Russian material, as in the Armenian, she is sui generis. Of three songs included by Prokofiev, particularly fine is ‘Green Glade’, playing into the rhapsodically free sound Dolukhanova could invoke in her upper register at any volume. Her version of Lyubasha's a capella song from the first Act of TSARSKAYA NEVESTA is among the finest I've heard. It reveals a detailed command of dynamics that versions featuring her pupil Olga Borodina lack, with, of course, that creamy tone and fast vibrato which are so distinctive. Kascheyevna's aria, ‘Nastala noch’, from KASHCHEY BESSMERTNÏY is as memorable as her recording of it under Gauk, which was my first exposure to her art. "Dolukhanova.... had inspiration, intelligence, high musical culture, meticulous taste, poise and nobility in expression of feelings and precision of intonation, not to mention an elegant and attractive stage presence. She had that 'mezzo vibrato' shared by almost all singers of this fach, but she knew how to use it to great musical effect, like a cellist." 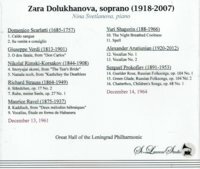 "[Dolukhanova] gave recitals in the U.S. in 1959, 1962 and 1970. In the early 1960s she made a transition to soprano with Yevgeny Kanger, a pianist, whom she names as her most important teacher. Her concerts were eagerly anticipated musical events because she kept to her rule of never singing the same song twice in a city no matter how many times she appeared there. Her farewell concert was at the Great Hall of the Moscow Conservatory in the Spring of 1983." 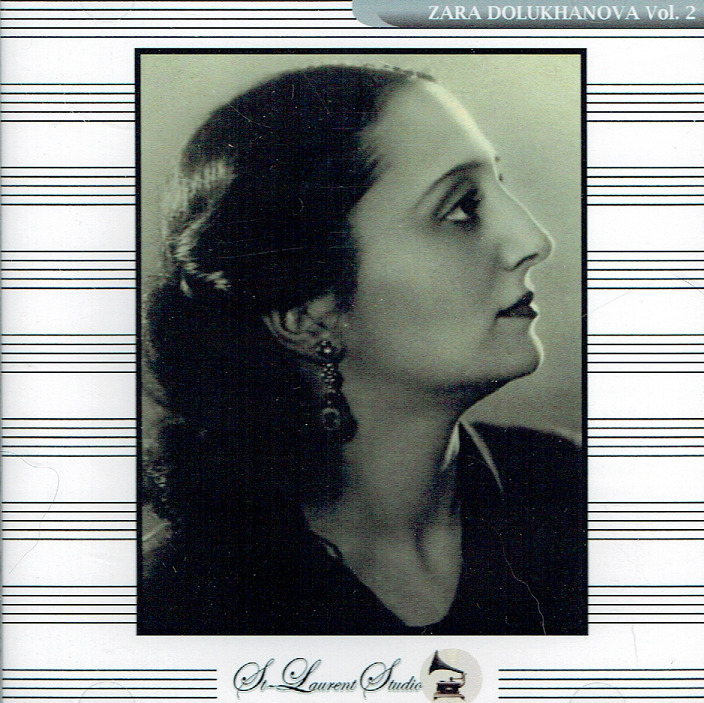 "Zara Dolukhanova is often cited as the greatest Soviet mezzo-soprano of her time. Her powerful, flexible voice was usually categorized as a coloratura mezzo, but her vocal range also allowed her to sing convincingly as an alto. Dolukhanova was as much a star in the Soviet Union in the mid-20th century as Callas and Tebaldi were in the West. She commanded a huge repertory inclusive of works ranging from J.S. Bach, Handel, and Vivaldi to Mozart, Rossini and Tchaikovsky and on to Prokofiev, Shostakovich, and Khachaturian. She sang folk and traditional songs as well, and was best known on the operatic stage for her Rossini, particularly as Angelina in LA CENERENTOLA and Isabella in L'ITALIANA IN ALGERI. But Dolukhanova is also remembered as a recitalist, earning herself the reputation as one of the world's greatest interpreters of art songs, becoming a sort of female counterpart to Fischer-Dieskau. She debuted in 1938 as Siebel in Gounod's FAUST at the Yerevan Opera in Armenia. After spending three years at the Yerevan Opera, Dolukhanova married composer Alexander Dolukhanian and thereafter performed under her married name. From 1944, she sang as a soloist for Moscow Radio. In the postwar years she gradually built her career in opera, concert, and recital fare. In 1959 she became a regular soloist with the Moscow Philharmonic Orchestra. She toured Europe and the Americas, making her U.S. debut in 1959 at Carnegie Hall, drawing scores of rave reviews. Dolukhanova was extremely active throughout the 1960s, but shortly after a return tour to the U.S. in 1970, she retired from singing. She spent most of the remainder of her career as a teacher at the Gnessin Institute, counting among her students mezzo-soprano Olga Borodina. Dolukhanova died in Moscow on 5 December, 2007."